The services with the Robin Hood theming. Trowell is one of few services which were handed to a smaller firm - this is the history of it. "The food is almost good on occasion." Bids to operate the services opened six months late and included entries from Regent Oil, Top Rank and Mecca Leisure. Rank wanted a bridge-design with the views looking away from the motorway, but they offered a very low turnover and were rejected. Mecca Leisure's hyper-local approach (using décor that had local connotations) helped them win the contract but this aproach wasn't unique to Trowell: in fact both Mecca and Rank bid for Hilton Park just a month later, and Farthing Corner earlier. Neither bid was successful, and it's not clear what design they would have used at those sites. Like all services, Mecca's grand design and insistence on providing the highest quality meant it was struggling to make any money. Unlike rival firms, they were not willing to cut corners to save cash, and instead on 3 September 1977 they sold the site to Granada, who inherited it in October. Mecca Leisure were owned by Grand Metropolitan, and their motorway services arm was managed by Michael Guthrie. After Trowell was sold, Mecca Leisure were sold to Rank and Michael Guthrie went on to create Pavilion. 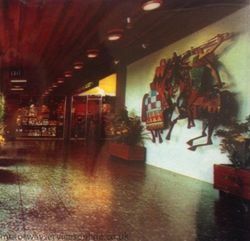 When it opened, operators Mecca Leisure insisted that visitors thought of it not as a service area but as a "village". The site was entirely themed around Robin Hood. This was all removed when Granada took over. Much of the specialised stock had caused Mecca Leisure trouble as they were not approved for sale on motorways at the time. It provided the usual choice of restaurants in a small, two-storey building. The restaurant was called Marian's Pantry. It had a green and red tinted ceiling, red lampshades, Tudor-style oak furniture and a red and green carpet with a leafy pattern. There was a zig-zag shaped counter on which to sit, as well as ordinary tables with place mats. Artificial trees were used inside all around, with a real garden outside. The café was a long room with windows all on one side, the other side having the service counter screened by tinted glass. Green trays were used. Hoping to catch a lot of coach trade, originally there would have been decorated and covered walkways from the entrance to the coach park. By the side of both buildings was a large grass area. Mecca's architecture did not impress inspectors, who said such a rural location did not deserve such an unsympathetic design. The bright cladding around the forecourt was described as particularly distracting. The southbound upper deck actually extends over the sliproads, to take advantage of the limited space available. In 1977 Egon Ronay made a rare positive comment about the services, describing the food as "almost good on occasion". It was the only place which he said was trying to provide a "comfortable, restful, pleasant restaurant", and appreciated the "extensive" menu. The café was not as good was the waitress service, but was still clean with prompt service. Sir Owen Williams, who did much of the M1's design work, wanted the services to serve as a farm junction, but was told it couldn't. The former upstairs restaurant is now used as an office. Under Granada a new coffee shop was introduced, and the upper level was initially stripped down to provide a more automated experience (with a conveyor belt to place dirty dishes on). This was called Platters. It later became office space. As a road safety trial, Mecca trialled a car wash here, but Granada removed it. In 1988 Edwina Currie (MP for South Derbyshire) was taken on a tour of the newly refurbished restaurant Granada were trialling. 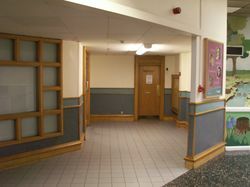 A new southbound dining area was then added to the lower level. That was then extended to provide one of the first mini-shopping malls, and a later a whole new lower level for dining on the northbound side. The greenery surrounding the buildings became parking and the motel. More recently, in 2016 the redundant units added to the front of the southbound services were used to create one of few indoor West Cornwall Pasty Company units. During early 2017, the southbound EDC restaurant was removed to make way for a M&S Simply Food store which opened in February 2017 to join its northbound counterpart.